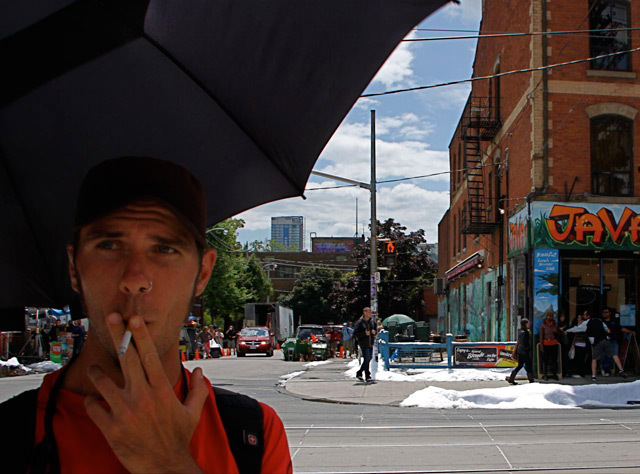 On a Queen West location shoot for Scott Pilgrim vs. The World yesterday, this is Dave vs. Bill Taylor. Dave (no last name) doesn’t think “blocker” is his official title but it’s his job description. 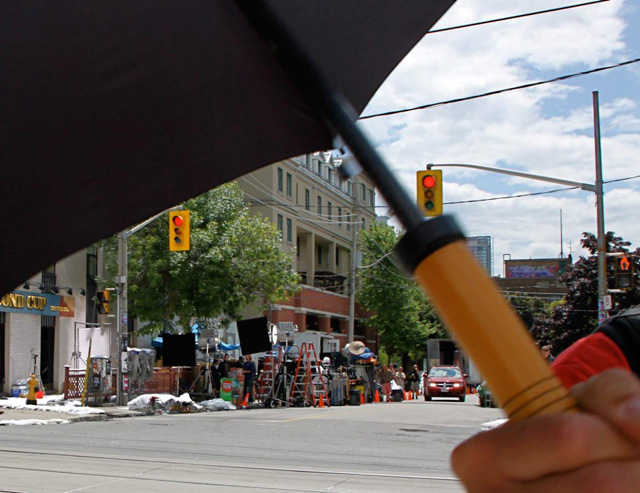 He’s there, with a large black umbrella, to stop anyone taking photographs of the movie shoot that has traffic crawling along Queen Street between Spadina Avenue and Portland Street and is blocking a lane of Richmond Street with its trucks. Dave admits that photographers are free to shoot what they like on a public street, but he’s also free to get in their way. Mainly, he says, the producers don’t want paparazzi shots of their stars, including (and these are hardly A-list celebs) Brampton-born Michael Cera (whose name, IMDb tells us, means “wax” in Spanish, Portuguese, and Italian); Mary Elizabeth Winstead; and Macaulay Culkin’s younger brother Kieran. “But they’re all indoors right now, anyway,” says Dave. So why are we going through this absurd umbrella dance? Answer comes there none. 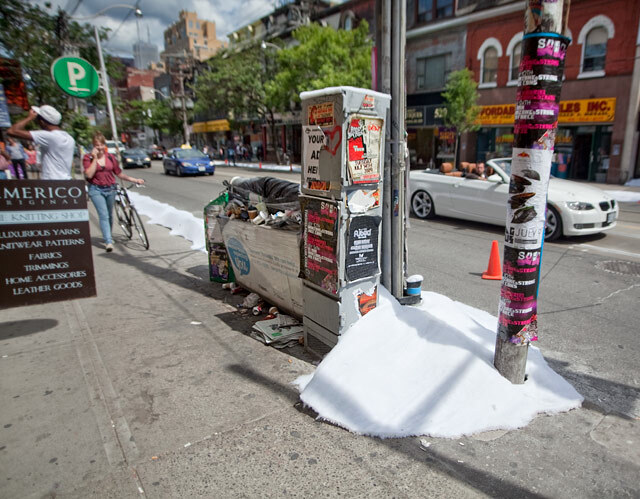 The Queen West shoot for the film—directed by Edgar Wright and based on Brian Lee O’Malley‘s graphic novel series—involves melting snow, which has been spread liberally along the sidewalks and even on top of a strikebound, overflowing garbage can. [EDITOR’S NOTE: Torontoist’s Miles Storey did manage to elude the heightened security to get shots of the scene on Tuesday; his photos are after the fold.] 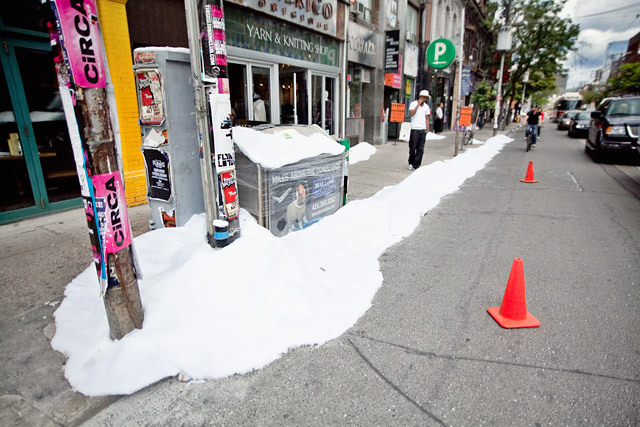 The snow is made from rolls of cotton overlaid with shaved ice brought in, Dave vouchsafes, from Montreal. What? Toronto’s shaved ice isn’t good enough?